It is time for us to write to Jason Chaffetz, the new Chair of the House Oversight and Government Reform Committee, to respectfully request that he move forward with holding hearings on Dr. William Thompson’s admission that he participated in the cover up of links between vaccines and autism at the Centers for Disease Control. We have learned from Dr. Thompson that a causal link between autism in black boys and the MMR vaccine, when given before age of three, was suppressed by CDC “higher-ups.”. Through the use of a collection of unethical statistical tricks, these senior officials at CDC chose to publish “reassuring” findings when the honest result of their analysis showed clear links between early vaccination with MMR and autism risk, both in African American boys and children with “isolated” (meaning normal in all other respects) autism. Members of Congress have spent many months reviewing the documents that Dr. Thompson turned over, debating which committee had proper jurisdiction in the matter, and have settled on OGR. Now we begin the process of holding OGR to the task of investigating this 15-year-long national scandal in depth. 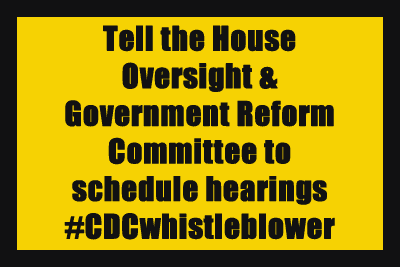 We also encourage you to tweet and FB to the committee and its members on a regular basis to educate them on developments in the #CDCwhistleblower scandal. It has been a long year for us as we have waited for the jurisdictional questions to be resolved; now it is up to us to help these Members of Congress face the difficult task of rooting out the lies that have harmed our children. No doubt they are all under immense pressure to preserve the status quo and let the CDC’s transgressions remain overlooked so they can continue their unethical “business as usual.” It is our task to respectfully educate them and empower them to act on our behalves, as they are chartered and required to do. They will face many obstacles to issuing the subpoenas that will be needed to get the truth out, so we must support them in acting on what will be an unpopular action among many of the powerful corporate interests that oppose us.